Say "boh-zhoh-lay noo-voh." This year's Beaujolais Nouveau has a screw top, which is just fine with me. Screw top not withstanding, France's Beaujolais has a very old tradition. Vineyards there date back to Roman times. 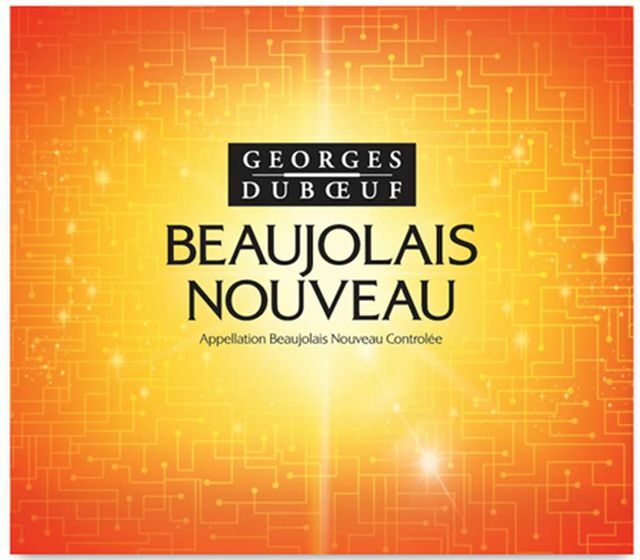 Nouveau Day celebrates the "new" wine of the year, the harvest, the miracle of fermentation. Now Beaujolais Nouveau has reached the status of a global celebration, shipped--with the benefit of modern transportation—to arrive at world markets on the same day it hits the Paris Bistros—the third Thursday of November, just in time for our Thanksgiving. And Beaujolais is the perfect wine to wash down that American tradition. It is 7 a.m. on that third Thursday. Beaujolais Nouveau displays are up and ready. While most of you gulp coffee and down oatmeal, I am sitting here in front of a breakfast of turkey, butternut squash, stuffing with cranberries--and big glass of Georges Duboeuf Beaujolais Nouveau. I also have a plate of more typical French stuff I found at my local D&W Fresh Market: an Ace bakery baguette (closest American loaf to a traditional French baguette), a large dollop of unsalted butter, a few slices of Three Little Pigs Country Pâté, and a nice slice of emmenthal cheese. I have my bottle in an icy water bath to cool it quickly. Yes, Beaujolais Nouveau is best served slightly chilled. So here we go. Pouring…The wine is beautiful, clear, with a deep almost bluish purple color. It has a grapy nose at first. But the taste is tart cherry, Michigan pie cherry. It seems a bit lighter bodied than last year’s version. But the sweetness of the turkey, squash, and stuffing highlights the fruit in the wine and makes the wine seem slightly richer. The plate of the traditional French goodies brings out the lively tart cherry flavors, a perfect complement to the creamy butter and cheese and the fatty pâté. The wine is once more delightful, light, fruity, refreshing, uncomplicated, a wine for parties, a wine even for people who don’t like wine, a gulpable wine. Ah, this is the life. Dinner at seven—a.m., that is. getting your supply as quickly as possible.